Co-owners, Karen Calkins and Cheryl Wilkes (pictured left) of Twice Told Tales. 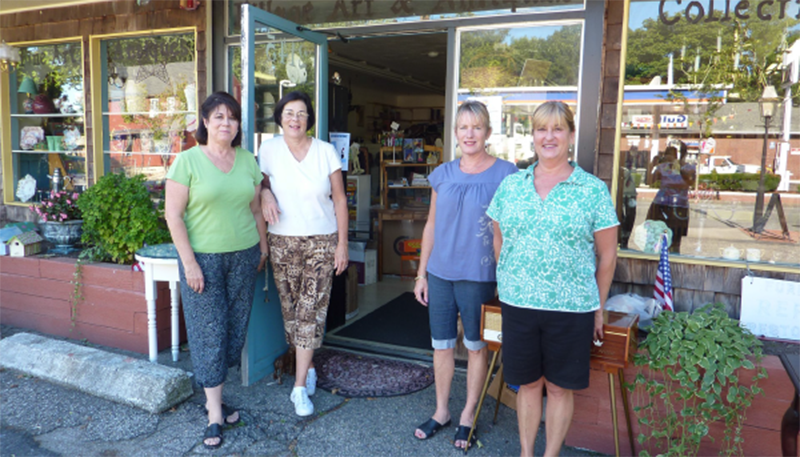 Pam Sheridan and Lil Mangan (pictured right), are owners of Village Art & Antiques. Both businesses share space at 2145 Broad Street in the heart of Pawtuxet Village. Twice Told Tales has been located in the oldest historic village in New England for over 30 years. We are a gift shop, book store and card shop. We are open every day at 10:00 am. Closing hours vary according to the season. We are proud to be a Rhode Island Trollbeads dealer! OPEN EVERY DAY at 10 a.m.
We carry an eclectic array of clothing, jewelry, and accessories, books, cards, and gifts, many of which are crafted by local artists, musicians, and artisans. We support many community activities and strive to maintain a personal, friendly relationship with our customers.